In 2012 Trevor and Tina visited Boquete, Panama, and fell in love with it. Both avid travellers, and with their two sons grown up, they were looking for a new adventure. They decided to stay. “Tina and I chose Boquete simply because of its amazing free style of living and the great potential it had to offer expats,” says Trevor. Boquete and the surrounding area have lots of great outdoor activities. In addition, the expat community and booming tourism have created new opportunities for businesses. The residents are welcoming, and people here like to socialize, enjoy each other’s company, and give back to the community. In Boquete, it didn’t take each of them long to find their special niche. “I am a licensed tour operator, and owner of A1 Private Tours Boquete,” says Trevor, “and Tina is an amazing artist and is very well-known for her handmade mola beach bags.” Tina sells her bags at the Tuesday market in Boquete and now has a lucrative business. “She has always been a true artist. She has always had the eye to create a magnificent and unique product,” adds Tevor. “Survival was the main motive for finding an income, but we were both being young and full of life and drive. It took only a short time for me to figure out that there was only one tour operator in Boquete offering jeep tours to the summit of Volcan Baru. This was going to be my niche for sure,” says Trevor. 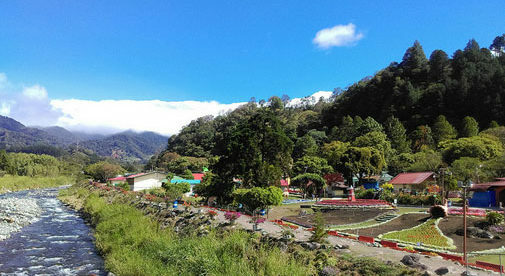 The tour to the top of Volcan Baru starts at 4 a.m., driving in the dark for two hours up rough rocky terrain to the height of 11,398 feet above sea level. You arrive just in time for the most fabulous sunrises, where you can see both the Caribbean Sea and the Pacific Ocean, as well as the total expanse of Panama, all at the same time. Fortunately, Trevor had already taken steps to setting up the business even before he knew what the business would be. “We had actually brought a Super Jeep Wrangler with us because we wanted to be ready to climb anything: not knowing at the time it would be the Volcano. That was a huge out of pocket expense already taken care of. We then just had to find a place to operate from in order to qualify for the Autoridad De Turismo (tour operator license),” he says. Trevor says even though they are both working most days of the year, they are living the lifestyle that they have always wanted. They have even built their own home with a separate casita. “Our businesses cover all our costs,” says Trevor. “We put an average of 95% back into the business and the remainder goes to living life.